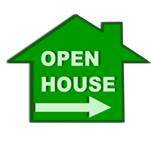 Real estate databases can turn a golden opportunity into a platinum opportunity when it comes to open houses. For years, meeting potential buyers at an open house has always been one of most reliable, time-tested ways to generate leads and new customers. There are not too many instances in real estate, in fact in any aspect of business, where a potential customer takes the time on a Sunday to drive across town to see you. There is a debate going on about this practice. In this digital age where buyers now don’t want to get in their cars, a huge percentage look for homes online from their living room. But for many agents, open houses still work. Very well indeed. In fact, according to the National Association of Realtors, sellers that were surveyed said in 2009 about 59% of the agents they used held an open house. In 2004, that number was 49%. And of course, sellers do love to see those open houses as well. So why do so many agents still use the same old one-page sheet printed out from the MLS listing to give to visitors? The one with the basic MLS info – square footage, key attributes like wood floors, types of utilities, etc. In 2017, with the resources that are available out there, why not step up your game? Integrate real estate databases and a home value estimator tool. There’s a big opportunity here. Let’s start with the real estate databases. By teaming up with national and credible real estate database providers such as Home Junction Inc., a broker or agent can add a widget to their website which gives them access to an enormous bank of hyper-local information. That information includes school data, recent home sales, home price trends, demographics, cost of living indices, crime ratings and local business listings. Print a second page for any open house handouts. Heck, just use the other side. Include key info from your hyper-local real estate databases. They might be serious buyers. They might be semi-serious. Or, they might just have nothing to do that day and decided to stop by on their Sunday drive around town. Doesn’t matter. You got something that could just tip any one of them into becoming buyer (and a seller). Give these visitors the handout. The serious ones have probably already reviewed the basic information on the website. Now, here’s the kicker, show them Page 2 with real estate databases provided by Home Junction. For example, recent home sale trends. Point out, for example, home sales in this neighborhood or marketplace are booming. It’s a hot area. If you are truly interested in a property around here, you better move fast. It’s the law of scarcity. A powerful law that can turn a looker into a buyer, a reluctant shopper into someone who is certainly very interested in making a move, not only to live there, but perhaps as an investment property. Do the same with home prices. Show the charts for home prices in the area. Point out how those prices are trending upward. Gee, this home is priced slightly LOWER than other properties in the area, a visitor might realize. Home Junction also provides a valuable Home Value Estimator tool, just like those available on the national real estate sites. Included in that tool is a percentile comparison (shown below). For example, the home estimation tool crunches the real estate data and spits out how that property compares to other homes in the market for several critical factors – Size, Price, Price per Square Foot, and Age. Show the results to visitors. Perhaps this home is in the lower percentile for prices per square foot. That’s a bargain. Or, maybe this is a relatively new home compared to others in the area. That’s a big selling point. Promote the home estimator tool to all visitors. You are the local agent. They are going to trust your insight into the local market. They are also going to trust the information and tools you provide about that market on your website. Let’s recap what happens when those visitors leave. For one, they will have a two-page handout with in-depth analysis of that property. If they visited other open houses and other agents, they will be impressed with the information you provide compared to the others. That will go far in looking for properties…and selling their property if they already own in the neighborhood and are looking to upgrade or purchase investment properties. Secondly, every visitor will now realize that your local real estate website has a home value estimate tool just like the national sites. Why bother going to those sites anymore to check out the value of their home or other properties or other relevant data such as property sales? This local agent has the same features on THEIR SITE. Consumers would rather deal with a local agent, someone who LIVES in the area, then a national site based thousands of miles away in another part of the country. Brokers and agents invest quite a bit of time and money in preparing for open houses. There’s the printing, marketing, advertisements, e-mail blasts, social media posts, signage, balloons, snacks, etc. etc. Make sure you maximize that opportunity to get a return on that investment. Stack up the info. All it takes is one customer. When it comes to open houses and frankly any home presentation, for buyers and sellers, real estate databases on your website can make a difference, an effective, hyper-local difference.